AN unknown actor has landed one of the most sought-after jobs on Aussie TV, joining Home and Away as the new bad boy of Summer Bay. Patrick O’Connor shot his first scenes some five months ago, playing River Boy Dean, with the character to make his debut later this month. “This is my first role,” O’Connor told The Sunday Telegraph. The River Boys gang have been central figures to the Home and Away plot line for several years, the most *famous of which is Steve Peacocke, who is now making a name for himself in Hollywood. Brisbane-raised O’Connor, 25, a Queensland University of Technology acting graduate, has spent the past few years auditioning for roles. “I got close with a couple of other roles on Home and Away,” he said. He said like his character, he is cheeky and loves the AFL. O’Connor doesn’t have any tattoos of his own and has enjoyed the fact his character has several. 'This is my first role': Actor Patrick O'Connor joins Home And Away and he's already causing drama in Summer Bay. Spoiler warning: This article includes details of a main character death that some readers may prefer to avoid. Home and Away is bringing back the River Boys this year – and new details have now been revealed about their highly-anticipated return. A dramatic promo released at the end of last year revealed that the surfer gang will be back at the centre of the Summer Bay drama in 2018, even though Brax, Heath and Casey are no more. Still going strong with new leaders in charge these days, the River Boys make their comeback after Ash calls on them for help in his quest for revenge against bad boy Robbo. In December, Australian fans of Home and Away watched in horror as the 2017 season finale episode saw pregnant Kat Chapman killed off in a road accident. The incident came as she was trying to flee the Bay with Robbo. Grieving following the devastating loss of Kat and their unborn baby, an irrational Ash bitterly blames Robbo for everything – and that's where the River Boys come in. Approaching the River Boys' new leader Dean, Ash asks him to target Robbo and hands over his picture. George Mason, who plays Ash, told Aussie magazine TV Week: "He's not thinking straight. He lost everything. He's seeing red for sure, and he's not thinking rationally any more." When Tori Morgan finds Robbo barely conscious in her back yard after Kat's wake, it seems that the River Boys have already made their move. Will Tori be able to help Robbo, and how would she feel if she knew about Ash's involvement? Home and Away newcomer Patrick O'Connor has been cast in the role of Dean and has been billed as Summer Bay's newest bad boy. When Dean arrives, viewers will discover that he already shares a connection with recent arrival Willow Harris. The pair meet up for a flirty date, hinting at a romantic past – but could that be rekindled now they're in the Bay together? Patrick O’Connor is putting his own stamp on the River Boys legacy. After several failed attempts to make his mark on the acting world, Patrick O'Connor has landed the role of a lifetime. In his first television gig, the 25-year-old has joined Home And Away as Dean, the new leader of the infamous River Boys. However, Patrick's big moment also comes with the pressure of meeting fans' expectations, including those set by his predecessor, Stephen Peacocke. The popular actor, who once led the River Boys as Darryl "Brax" Braxton, left big shoes to fill when he left the show in 2016. Patrick admits he was nervous. "The bad-boy role always has a bit of heat around it, and Steve left behind such a legacy," he tells TV WEEK. "But you're able to have a bit of fun with it, so that's exciting." Born in Melbourne, Patrick found his love of the arts in his final year of high school. He went on to complete an acting course in Brisbane, before making the move to Sydney in 2015. After several trips around the audition circuit, he's more than ready to make his mark. "I want to be different and make this role my own," Patrick says. "But at the same time, keep in touch with what it is to be a River Boy." To prepare for the role, Patrick watched old episodes of H&A and sought advice from former stars Lincoln Younes and Nic Westaway. "The boys loved their time on the show and told me to have fun with it," Patrick says. "I've also met Steve a few times and he's a lovely guy." With fans and paparazzi already seeking out the newcomer on Sydney's Palm Beach, Patrick is bracing himself for what's to come – including the female attention. "I'm aware that the River Boy role gets a bit of attention, but I don't think about it," he laughs. "Sometimes fans come to watch us film and it can be a little nerve-racking. For the most part, it's fine." "A couple of times, the fans have seen the 'Blood And Sand' tattoo and got a little carried away," Patrick laughs. "But it's cool." "Steve left behind such a legacy." Elsewhere in the Bay, Willow Harris and Justin Morgan receive a shock when Dean Thompson crosses the line. Willow (Sarah Roberts) shares a romantic connection with the new River Boy in town, as they're old friends and things between them occasionally went further than that back in the day. Clearly fed up with seeing Willow dating Justin, cocky Dean (Patrick O'Connor) breaks into her caravan and waits for her in bed. Willow and Justin (James Stewart) can't believe their eyes when they return to the van to find Dean lying there, but they're in no mood for his games and kick him out. After Dean cheekily claims that he thought Willow wouldn't mind, Justin warns him off by claiming that any romantic spark they shared is now over. Dean fires back by telling Justin that Willow doesn't do long-term relationships and it'll end in tears. Is Dean's jealousy getting the better of him, or could Willow and Justin be heading for heartbreak in the long-run? Home and Away airs these scenes on Tuesday, April 10 and Wednesday, April 11 at 1.15pm and 6pm on Channel 5. Is both Dean and the new cop ex boyfriends of Willow? Home and Away newcomer Dean Thompson spies an opportunity to cause trouble between Willow Harris and Justin Morgan next month. Dean (Patrick O'Connor) can't resist stirring things up when he spots that Willow and Justin have fallen out over care of Justin's young daughter Ava. Following Ava's surprise return to Summer Bay, viewers will see kind-hearted Willow (Sarah Roberts) strike up an easy bond with her. When Willow gets some time alone with Ava, she lets the youngster help out with some cooking while she washes the dog outside. Unfortunately, Justin (James Stewart) is outraged when he returns home and sees that Ava is dealing with boiling water and sharp knives while unattended. Taken aback by Justin's ferocious reaction to her mistake, Willow is left with no choice but to get straight out of there. Later on, Willow vents to her old flame Dean about the situation, seeing Justin's behaviour as a complete overreaction. Dean is loving every minute of the tension and takes steps to make it even worse, telling Willow that it's obvious Justin doesn't respect her. Even when Justin attempts to apologise later that day, Willow is still defensive after being wound up by Dean. Has he succeeded in driving a wedge between them? Home and Away airs these scenes on Tuesday, May 8 and Wednesday, May 9 at 1.15pm and 6pm on Channel 5. Will this make life even worse for him? Home and Away will be exploring Dean Thompson's relationship with his wayward mother in a new storyline. Show bosses are delving deeper into the River Boy's backstory as his life continues to spiral out of control. 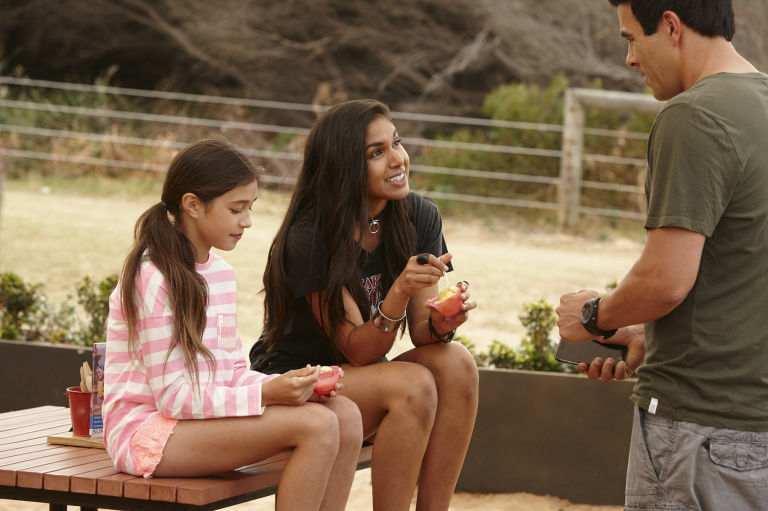 Recent episodes in Australia have already started to sow the seeds for the family-based drama ahead, with Dean (Patrick O'Connor) currently facing a possible prison sentence. The bad boy has decided to take the blame for Willow Harris's recent crime spree, threatening his future in Summer Bay. Needing someone to talk to about his predicament, Dean tries to reach out to his mum Karen but is left heartbroken when she callously hangs up on him. When Dean goes off the rails afterwards and drowns his sorrows, Willow (Sarah Roberts) spots the call to Karen on his phone and realises that his irresponsible mother is the source of his latest setback. These scenes are paving the way for Home and Away to introduce Karen in a few weeks' time. Advance spoilers for the show have revealed that Karen will arrive in the Bay in early October at Australian pace, with her first scenes on Channel 5 following for UK viewers a few weeks later. Actress Georgia Adamson has been cast in the role of Karen. Is a workplace romance on the horizon? ...Elsewhere in Summer Bay, Dean Thompson remains a cause for concern as he continues to spiral out of control. Dean (Patrick O'Connor) finally has some good luck next week when he avoids a prison sentence at his court hearing, getting handed a community service order and Good Behaviour Bond instead. Although Dean has clearly got off lightly, he continues to behave badly by drinking heavily and turning up late for his community service. Fearing that Dean's downward spiral is partly down to his troubled relationship with his absent mum, Willow (Sarah Roberts) and Colby try to get him back on the right track. Can a dose of tough love work any wonders on Dean? Home and Away airs these scenes on Tuesday, October 16 at 1.15pm and 6pm on Channel 5. Will Karen finally get the help she needs? 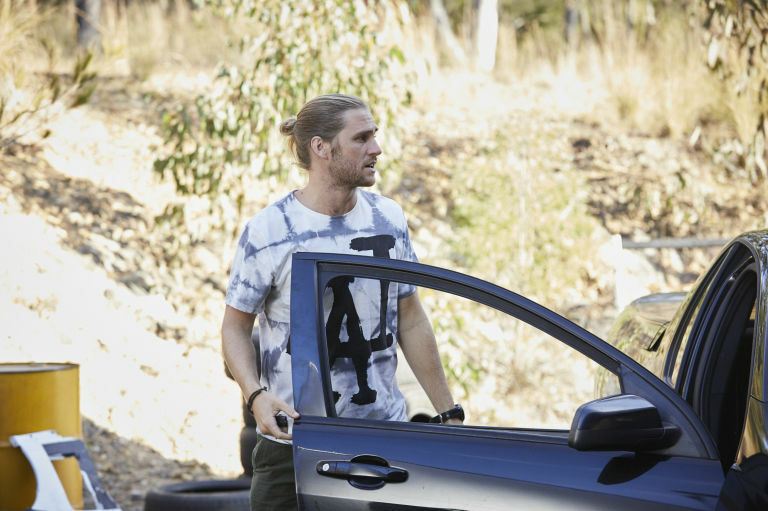 Home and Away's Dean Thompson finally accepts that his mother Karen needs help next week after she subjects him to a nasty attack. Dean (Patrick O'Connor) has spent years in denial over his mum's mental health problems, despite friends like Willow Harris urging him to address them. Upcoming episodes see Dean urge Karen (Georgia Adamson) to consider seeking professional help after she nearly killed John Palmer by running him over. Dean's advice doesn't go down well with Karen, who grabs a frying pan in his caravan and hits him across the head with it. Carrying on as normal while Dean lies unconscious, Karen turns on the gas hob and searches unsuccessfully for matches. When she finally gives up, she heads to the caravan's bedroom and forgets all about the gas. Later on, Willow (Sarah Roberts) arrives on the scene and calls for urgent help, which leads to the arrival of police and medics. Karen is loaded into an ambulance, closely followed by Dean as Willow, Colby and Chelsea all watch on in horror. Finally realising things can't go on like this, Dean later signs paperwork as Karen's next of kin, giving his permission for her to receive a psych assessment. Will this help Karen to turn a corner? Home and Away airs these scenes on Tuesday, November 6 and Wednesday, November 7 at 1.15pm and 6pm on Channel 5.